This is our first solar-powered donation box and was commissioned by Kent Wild-Life Trust for their visitor centre near Maidstone. We recently made this video. The tree with birds are inside a glass dome and the leaves of the tree are made of tiny solar panels used for sloar powerd wateches. When the public make their £1 donation, the bird eats out of their hand and the baby birds in the nest show their appreciation. The advantage of a solar powered box is there are no electric wires or sockets involved and it can be moved around easily to find the best sun-lit location. The visitor centre is in an old barn and is a lively place with exhibitons and school workshops. Donation Bird Box from Max Wilkinson on Vimeo. 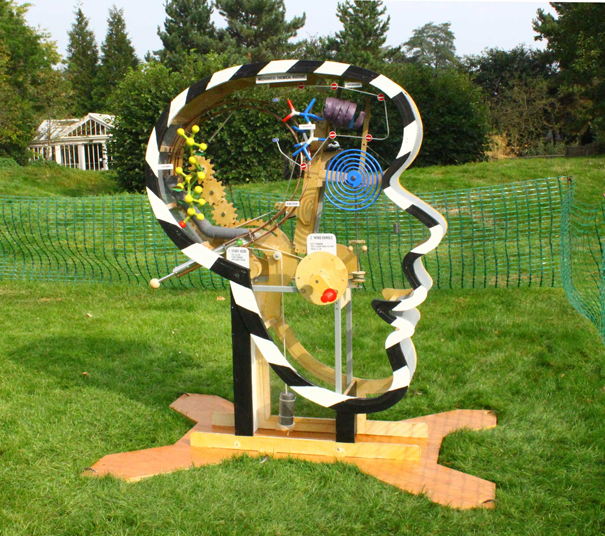 The Mechanical Chemical Machine was commissioned by Kew Gardens RBG for their Intoxication Season a festival of mind altering plant chemicals from caffeine to cannabis. Our machine was to be an interactive machine demonstrating how a plant chemical interacts with receptors in the brain to produce an out of the ordinary effect. By way of a pinball mechanism, the public were invited to fire the plant chemical into the blood stream. Then using a second handle they activated the plant chemical to move across the brain barrier, interact with the brain receptor, which changes the shape of the receptor and stimulate the brain, which we showed as a spiralling eye. We had 20 days to design and build a machine for outside use to withstand the rigours of the British weather and enthusiastic boys. But eventually, with regular maintenance visits, managed it. 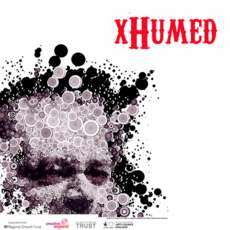 We designed and made The Speaking Machine for a new performance called Xhumed - Dead Good Thinking conceived by Samara & Jason Hall-Jones of Xhumed BHX13. It was performed at the New Library of Birmingham and was a series of, what can only be described as, TED style lectures but with dead people. Erasmus Darwin, the grandfather of Charles, described a talking Machine and our job was to create his vision. He wrote "...I contrived a wooden mouth with lips of soft leather, and with a vale back part of it for nostrils, both which could be quickly opened or closed by the pressure of the fingers…. 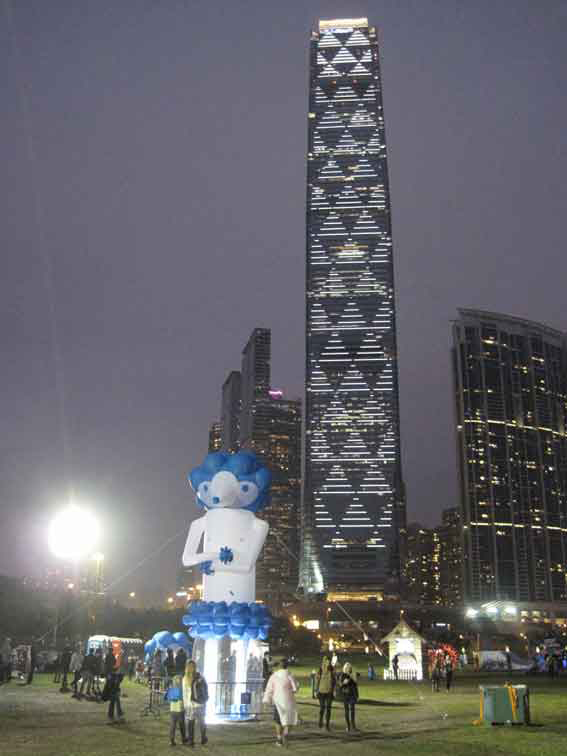 or which if built in a gigantic form, might speak so loud as to command an army or instruct a crowd." Erasmus Darwin (TEMPLE OF NATURE). We added the chin and teeth to make it more theatrical and indeed in the second performance the audience, when commanded to stand, did so. We have received Ward Working funding of £2,500 from Brent Council to make one of our Dandelion wind sculptures for our local high street in Kensal Rise. We need a further £1,500 to install by this November and are asking local business and residents to contribute to, not only brighten up the neighbourhood, but initiate an art trail in the area. Fund raising will be taking place at this weekend's Queens Park day. Or people can donate directly to us at info@artsrepublic.co.uk. 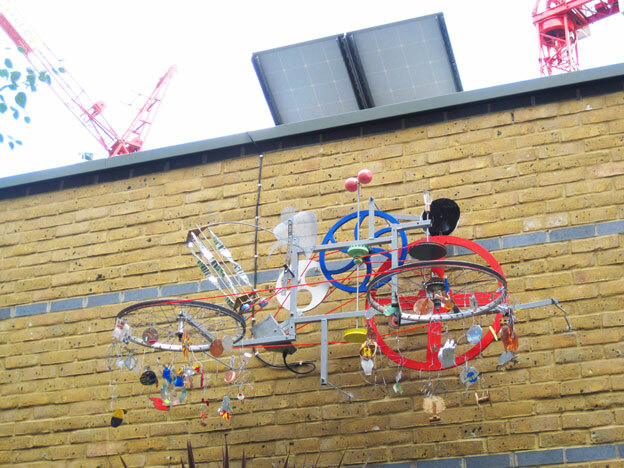 July 2013 we installed a new solar powered sculpture called The Sun Machine. It was made with Year 7 ofWestminster City School during Artweek last summer term. The theme was the Sun - the science, mythology and symbolism behind it. After an initial brainstorming session each student made small sculpture and many of these became part of the artwork and can be seen suspended form the bicycle wheels. Two photo voltaic panels are directly connected to the sculpture, so it moves only when the sun shines. We purposely left the panels visable, although there is some mixed feeling about their aesthetic value, but we think it's important to the artwork conceptually. It was an especially interesting project for the school and us as it brought both art and design technology departments together, unusual in many schools to have this cross over. 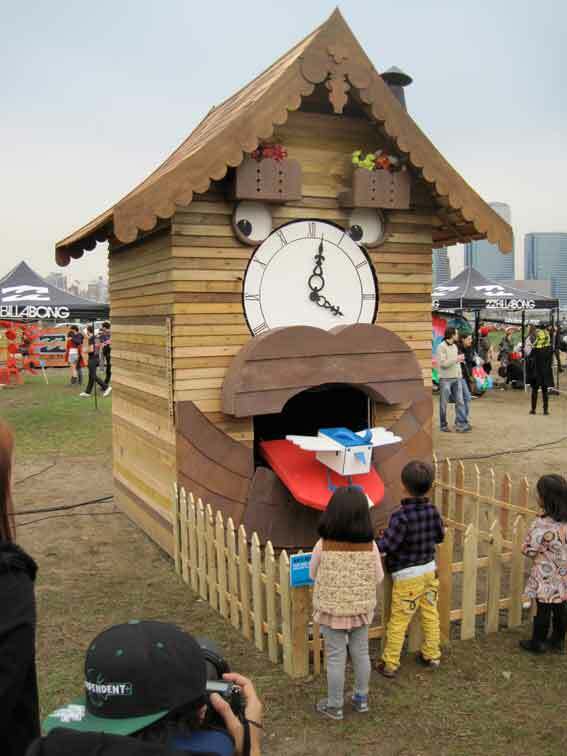 We made the Cuckoo Clock for Clockenflap Music festival in Hong Kong December 2012 with our son Jack. They eyes are the swivelling pendulum and the numbers on the clock face flip out every 15 minutes whereupon the moustache lifts, the tongue sticks out with the Clockenflap bird frenetically flapping on the tip.